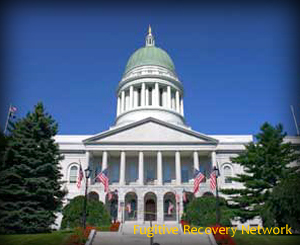 Below is basic information on bail bond laws for Maine concerning Bail Enforcement, Bounty Hunters, Fugitive Apprehension and Bail Bondsman. This is not legal advice. Laws change frequently, please check the links provided for possible updates and current information. ME Rule Of Criminal Procedure, Rule 46. Certain Procedural Provisions Governing Bail (f) Forfeiture. Preconviction. Each surety for a defendant admitted to pre-conviction bail is responsible for the appearance of the defendant at all times as well as the defendant’s compliance with each condition of release, including that the defendant refrain from new criminal conduct, until a verdict or finding or plea of guilty or until the acceptance of a plea of guilty or nolo contendere, unless the surety has sooner terminated the agreement to act as surety and has been relieved of the responsibility in accordance with section 1073. A pre-conviction surety is not responsible for the appearance of a defendant after conviction nor for the defendant’s compliance with the conditions of release, unless the surety has agreed to act as postconviction surety. Post-conviction. Each surety for a defendant admitted to bail after conviction is responsible for the defendant’s appearance at all times until the defendant enters into execution of any sentence of imprisonment as well as the defendant’s compliance with each condition of release, including that the defendant refrain from new criminal conduct, unless the surety has sooner terminated the agreement to act as surety and has been relieved of the responsibility in accordance with section 1073. Please check with the Maine’s Department of Insurance, Licensing Board and/or Local Law Enforcement for the most recent updates. If you know of any updates to Maine’s bail bond laws, please provide as much detail as possible and send to us using our contact form.